Inhabiting thorns on Acacia drepanolobioum west on Insinya, Kajiado, Kenya. Dec. 2014. Dozens of these ants emerged from inside the thorn and began attacking when the plant was touched. 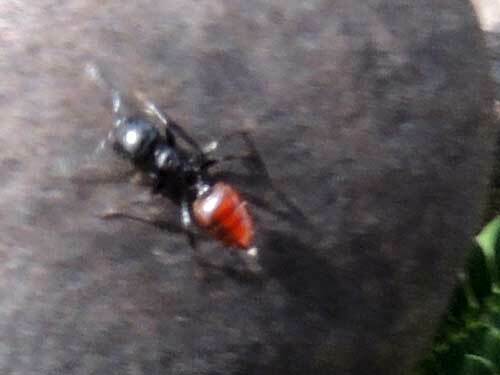 Crematogaster is a large genus of small ants that have a world-wide distribution and are easily recognized. Most are very small, less than 4 mm, and have a tear-drop or heart-shaped abdomen that can be readily rotated and bent. They are very often encountered on trees and shrubs where they prey on small insects and feed also on sugary substances. 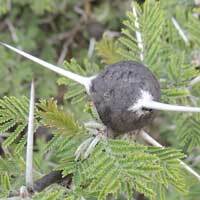 This species inhabits the hollow thorn bases of Whistling Thorn Acacias. It is by design that these ants are invited by the plant because the ants' rapid response and stings are effective deterrents to many herbivores (Well, all this really happens over millions of generations via natural selection. ).